The battle for Quebec in the federal election campaign heated up on Thursday with Conservative Leader Stephen Harper telling a Montreal audience that Liberal Leader Stéphane Dion's carbon tax proposal threatens Canada's national unity. Conservative Leader Stephen Harper's hopes for a majority rest in Quebec, where the party hopes to take 25 seats on Oct. 14. 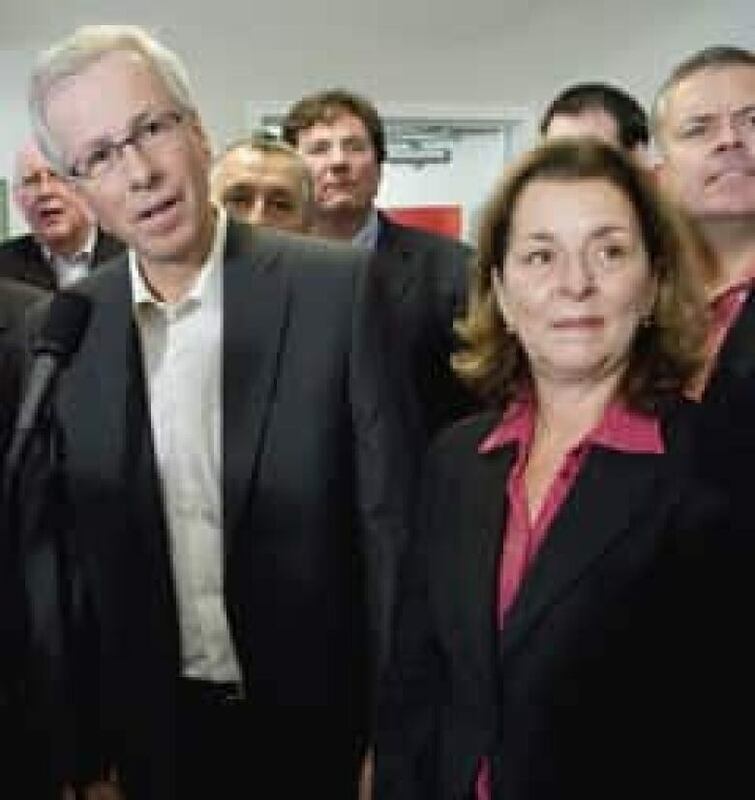 ((Tom Hanson/Canadian Press) )The battle for Quebec in the federal election campaign heated up on Thursday with Conservative Leader Stephen Harper telling a Montreal audience that Liberal Leader Stéphane Dion's carbon tax proposal threatens Canada's national unity. 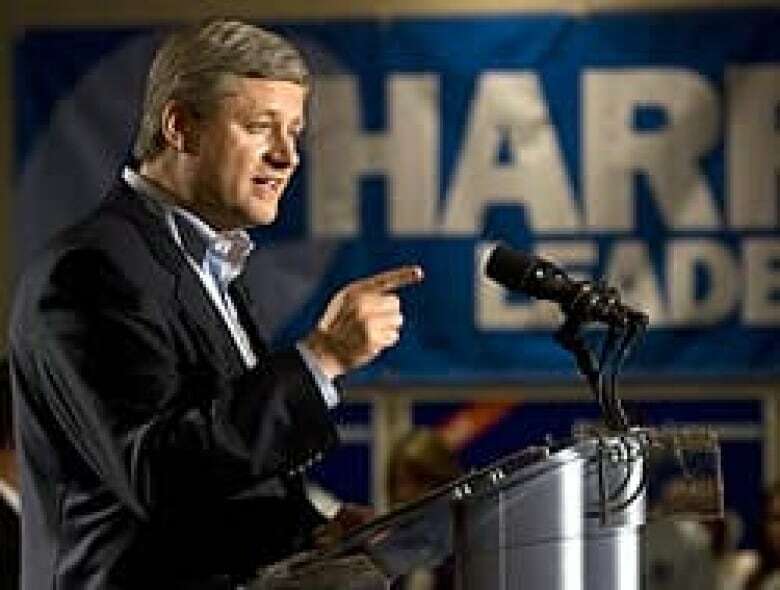 "The carbon tax will do more than undermine the economy," Harper said to a crowd of business leaders. "By undermining the economy and by re-centralizing money and power in Ottawa, it can only undermine the progress we have been making on national unity." Harper's comments appear to step up the Tories' relentless attacks on Dion's Green Shift plan, which would balance a carbon tax with income-tax cuts. New Brunswick Premier Shawn Graham, left, federal Liberal Leader Stéphane Dion and his wife Janine Krieber listen to a question during a campaign stop in Saint John, N.B., on Thursday. ((Adrian Wyld/Canadian Press))An outraged Dion quickly struck back at his rival, calling Harper's comments "irresponsible," and citing his record in taking on Lucien Bouchard as intergovernmental affairs minister and succeeding in drafting and passing the Clarity Act into law. "While he was busy talking about building firewalls in the West, I was fighting to keep my country together," Dion said in New Brunswick, where he was speaking to the Board of Trade. "I do not need any lessons from Stephen Harper on fighting for the national unity of my country." Harper said his government has operated on the basis of a strong economy aiding Canada's unity, and that a recession caused by Dion's carbon tax would create "all kinds of political tensions" across the country. He said his party shared a particular concern with Quebec over the federal government attempting to coalesce more power and money in Ottawa. "We've gone out of our way in the last few years to get the federal government working on its own jurisdictions, respecting provincial jurisdiction, so I think this would be a step in the wrong direction," Harper told reporters after his speech. Harper also told the Montreal crowd he is not interested in reopening the issue of Quebec and the Constitution for the moment. Harper will spend the rest of the day in Quebec in an attempt to appeal to rural voters before he flies to Halifax in the evening, said the CBC's Julie Van Dusen. "Quebec is the key for [Harper] to win a majority," she said, adding the Tories hope to win 25 seats in the Oct. 14 election. They won 10 in the 2006 vote. Dion has touted the Green Shift plan by saying a large number of economists and environmentalists have endorsed it, but the Tories have dismissed the proposal as risky and largely based on theory. On Thursday, Dion argued Canada could face punishment from the international community through tariffs on energy exports if it doesn't shift toward greener policies and cleaner fuels. He said his plan will prevent this by taxing greenhouse gas emissions and at the same time help companies buy the best green equipment. New Brunswick Liberal Premier Shawn Graham told reporters he supports Dion's green plan, along with his cabinet and his party's members in the legislature. Also Thursday, NDP Leader Jack Layton made a direct appeal to voters in his native province of Quebec while announcing his party's environmental plan, saying the New Democrats were the "real environmental leader" in the province. Layton, who for the most part refrained from targeting Dion during the campaign, also said the Liberal leader "is not going to be a main issue" in this federal election. Layton pumped his party's green platform — which calls for a cap-and-trade system, an 80 per cent reduction in greenhouse gas emissions by 2050 and a $750-million green-collar jobs fund — over Dion's Green Shift, saying the proposed Liberal carbon-tax plan is wrong-headed and won't work. But he reserved his harshest words for Harper and the Tories, saying they had no environmental plan at all. Earlier in the day, the Montreal-born Layton also brought up former Parti Québécois cabinet minister Jacques Brassard's comment on Wednesday that the Bloc Québécois was becoming a "clone" of the NDP. He told reporters during a Montreal campaign stop that unlike the Bloc, "we aren't there just to criticize Stephen Harper. "We're there to replace him," he said. "I am running in this election to replace Stephen Harper and to take his job from him. That's something [Bloc Leader] Gilles Duceppe can't do." Later Thursday, Dion is expected to head to Thunder Bay, Ont., where one of the seats is held by Liberal incumbent Ken Boschoff, while the other was vacated by Joe Comuzzi, who was elected a Liberal, but crossed the floor to the Conservatives in June 2007. Both seats will be closely contested, said Van Dusen. A day after winning her battle to be included in October's televised leaders debates, Green party Leader Elizabeth May campaigned in Antigonish, N.S. Layton's Quebec visit coincides with the NDP's launch of an advertising campaign in the province that compares Harper's policies to those of U.S. President George W. Bush, featuring a black-and-white split-screen image of the two leaders. While the New Democrats scored with Thomas Mulcair's byelection victory in Quebec earlier this year, the party is hoping to break into the province by capturing six to 12 seats in the general election in and around Montreal, Quebec City and the Eastern Townships, the CBC's Rosemary Barton reported from the campaign. Meanwhile, the Bloc's Duceppe campaigned in the Quebec towns of Huntingdon and Valleyfield before heading to Montreal for an evening speech. YOUR VIEW: What issues would you like to hear more about?